This page provides a table compilation of common and uncommon crystals. See also the urinalysis atlas. Ammonium biurate Usually acidic to neutral, rarely alkaline: pH ≤ 7 Variably sized, mostly small to medium, brown, spherical to irregular crystals (“thorny” apple). Common in Dalmations, English bulldogs. 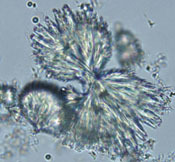 In other breeds of dogs or cats, ammonium crystals suggest liver dysfunction and portosystemic shunting. May occur with amorphous urates or sodium urate (needles or prisms) but uncommonly. Xanthine crystals, which can form after allopurinol treatment, can mimic ammonium biurate crystals (yellow-brown with small projections [Uchiumi and Grindem 2015]), so animals should be checked for this drug treatment. 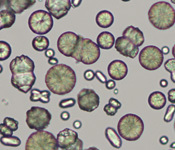 Amorphous Phosphates: pH ≥ 7 Urates: pH ≤ 7 Small, irregularly shaped crystals. 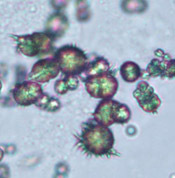 Can be of different composition (urates, xanthine, phosphate) depending on pH.Can be seen in healthy animals.Mimic bacterial cocci – perform a gram stain or regular cytology smear to differentiate. Bilirubin Acidic: pH < 7 Small needle-like to granular yellow or yellow-brown crystals.Indicates bilirubinuria due to conjugated (direct) bilirubin.Bilirubinuria can be normal in dogs (to some degree) but is abnormal in other species. Calcium carbonate Usually alkaline: pH ≥ 7 Variably sized, with the circular variants typically being medium to large, spherical to irregular (rhomboid, dumb-bell, ovoid) yellow to colorless crystals. Spherical forms have radial striations.Normal in horses, guinea pigs. Not normally seen in dogs, cats or ruminants. Calcium oxalate dihydrate Usually neutral to acidic: pH ≤ 7 Mostly small, but can be large. 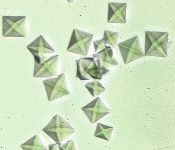 Colorless octahedrons, “envelopes”.Can be seen in healthy animals or in animals with calcium oxalate uroliths. Can also be seen with hypercalciuria or hyperoxaluria (eg. ethylene glycol or oxalate rich plant ingestion). Develop over time with storage of urine. 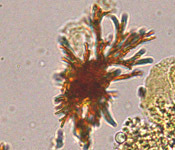 Magnesium ammonium phosphate (struvite) Usually neutral to alkaline: pH ≥ 7 Usually large.Can be seen in healthy dogs, cats and ruminants. 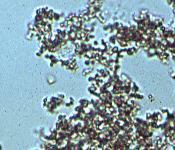 Also common in bacterial-induced alkalinuria and with sterile struvite or mixed uroliths. Calcium oxalate monohydrate Usually neutral or acidic: pH ≤ 7 Mostly medium to small.Oval, spindle, dumb-bell and picket shaped forms. 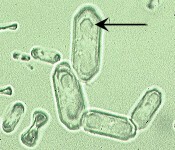 Oval, spindle or dumb-bell forms are infrequently seen in urine from healthy dogs and cats but can be seen in hypercalciuric conditions and ethylene glycol toxicity.Picket fence form (arrow) are commonly observed in ethylene glycol toxicity in dogs and cats, but can also be seen in animals with hypercalciuria due to other causes (e.g. lymphoma). Cystine Usually neutral to acidic: pH ≤ 7 Variably sized, mostly medium. 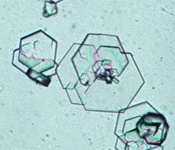 Flat colorless hexagonal plates, which often aggregates.Indicative of cystinuria, a rare inborn error of amino acid metabolism affecting many breeds of dogs. 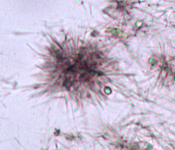 Unknown crystals: (i) needles (ii) needle-like bundles (iii) flat plates resembling cholesterol Variable pH All the crystals shown on the left were seen in the urine from dogs. Their identity is uncertain. Variable shape. 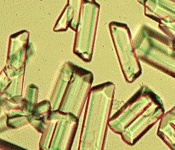 Solubility assessed with hydrochloric acid, acetic acid and sodium hydroxide – solubility characteristics do not match those of known crystals. Significance dependent on clinical signs and history.